The London Mint Office, who sell commemorative coins celebrating global historic events and milestones, shares its latest historic collection with The Collection Museum in Lincoln and schools in Lincolnshire, allowing the general public and local school children the chance to see some of the famous 1,700 years old ‘Near Spilsby’ Hoard of Roman coins. Hand selected coins will be donated to local Spilsby schools to support the curriculum on the Roman Empire, where the coins will be used as a teaching resource to further pupils’ understanding of coinage, why it was important and how significant it was for the region in the Roman period, which is particularly pertinent since the coins were found nearby. In addition, and as recognition of the historical context of the discovery, a portion of the coins will also be donated to The Collection Museum in Lincoln city centre as a permanent reminder of the area’s rich Roman heritage. 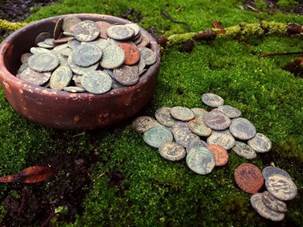 The mainly bronze hoard was discovered in 2014 on farmland in Lincolnshire by two metal detectorists, and purchased at auction by The London Mint Office, a company at the very centre of British coin collecting. The coins feature Roman emperor Constantine the Great and members of his family, and would have been buried in the ground near Spilsby around 340 AD by an owner who never returned for them. The majority of the coins were produced in Roman mints at Arles, Lyon and Trier, while some were struck at the ancient Roman cities of Siscia and Aquileia as well as Rome.